The Jan 30 edition of the New Yorker has a fantastic article by Jonah Lehrer about brainstorming. Read it here: GroupThink by Jonah Lehrer (subscription required). The conclusion of the article is quite surprising. Studies show that groups using brainstorming techniques churn out fewer ideas than if the individual participants had written down a list of ideas on their own. Also, the ideas that were generated were poorer quality than the individual efforts. The ineffectiveness of brainstorming stems from the very thing that we thought made it important - not critiquing other's ideas. Lehrer explains that the key to a productive group thinking session is to encourage debate and dissent. When someone says something that you don't agree with it gets the brain working, and forces you to question your assumptions. Rather than spit out any random thing, you actually have to think! So, let's put this into practice! But how do you have a reasoned debate session that doesn't erupt into a heated argument? Make sure someone is in control. Their job is to keep everyone on topic and to ensure that everyone gets a fair say. Start with phrasing the problem like a question and have it written down on a white board for all to see. If the adjudicator is spotting someone going off target they can then swing them back by pointing at the question. Instead of saying 'You are wrong' say 'I disagree with you'. The key is to focus on what people are saying. Avoid inflammatory phrases. As soon as you say "That's a stupid idea" it sounds like you're saying "You are stupid." This naturally causes people to get defensive and guarded. If the idea is stupid, you need to explain why it's stupid. 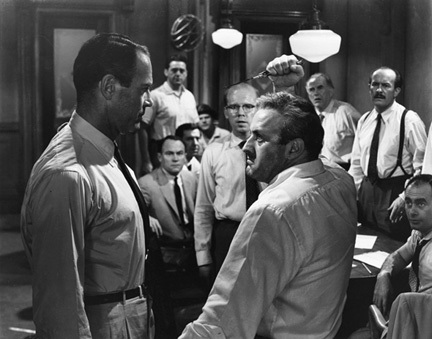 12 Angry Men - the best way to come to an agreement? One person should speak at a time while the group listens. Put your pride aside and listen to what people have to say. Don't interrupt when someone's saying something that sounds dumb, instead make a quick note on a piece of paper and then continue hearing them out. Let them have their say, and when they're done let 'em have it. Debates can get tiresome - especially if you're not sure how much longer you have to go! Make these meetings last no longer than 25 minutes. Any shorter and you don't have enough time for a proper debate, any longer and people lose interest and their brains get fried.